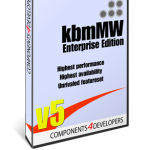 kbmMW Professional and Enterprise Edition v. 5.01.00 released! be capable of in the real world! – RAD Studio 10.2 Tokyo support including Linux support (in beta). – Huge number of new features and improvements! to easy storage and retrieval of objects from/to databases. – New high quality random functions. – New high quality pronouncable password generators. also supports the object notation framework. YAML, BSON and Messagepack in addition to JSON and XML. – CORS support in REST/HTML services. – High performance HTTPSys transport for Windows. – Focus on central performance improvements. – Pre XE2 compilers no longer officially supported. Look at end of post for detailed list of additions, changes and fixes. Delphi/Win32 SKU, contains a limited feature set and do not include source. via our flagship product kbmMW. Unix, Mainframes, Minis, Embedded and many other places. institutions, FDA approved medical devices, military and more. Include new sample simpleinvocation LinuxServer demo. that will mean the IP address without the port number. – Added IkbmMWLogFormatter interface to kbmMWLog. type (info/warning/error/fatal etc) and log string. bytes or strings without interpretation/reformatting. It is used as a fallback in case the regular log system excepts. if an unknown type is accessed or not (default true). – Added support for marshalling/unmarshalling TDictionary<K,V> types. The job will be automatically unscheduled after the run. events. Running events will be allowed to finish. – Added CheckNodeByGivenName, NodeByGivenName to TkbmMWXMLNodeList. – Added missing ADSDBF support to kbmMWReg. the table when an operation did not succeed, and resolving will continue. for the specific record if key is null. – Added LOB blob/clob support (user fix) to DOA adapter. – Vastly improved XSD importer. – Added YAML parser/generator based on object notation framework. – Added Messagepack parser/generator based on object notation framework. – Added BSON parser/generator based on object notation framework. – Updated transports to support marshalling objects via the transport. TkbmMWGenerateShortGUID and many more to improve performance overall. – Added many new general purpose functions to kbmMWGlobal. – Added new kbmMWRTTI unit with loads of RTTI functionality. – Added YAML stream format for kbmMemTable and descendants. – Added Messagepack stream format for kbmMemTable and descendants. – Added BSON stream format for kbmMemTable and descendants. – Added object marshalling to and from YAML. – Added object marshalling to and from Messagepack. – Added object marshalling to and from BSON. – Added ServicePath property to TkbmMWClientIdentity. for high performance RESTful applications. – Added LocalSinceEpochMS, UTCSinceEpochMS, Temporenc to TkbmMWDateTime. is a very compact binary encoding of a datetime value. – Added ExceptOnUnknownType boolean property to TkbmMWCustomRTTIMarshal. unmarshalled, or it should be silently skipped. – Added Devart MyDAC support (DMYDAC). – Added PerformOPTIONS and PerformPATCH support to TkbmMWCestomHTTPService. (OnOptions and OnPatch in TkbmMWEventHTTPService). is used for smart services. – Added high quality random functions in new kbmMWRandom unit. – Added support for ExchangeType in TkbmMWAMQPClient. defunct/cached but unused AMQP channels. – Added IPVersion property to TkbmMWCustomTCPIPIndyClientTransport. to make kbmMWGlobal smaller, partly due to internal compiler errors. unstable compiler which can result in F2084/C2491 error combinations. – Moved all lockfree code to new kbmMWLockFree.pas unit. in unit kbmMWORM.pas. Compiles with XE5 and higher. Check new ORM demos. of any length, suitable for cryptographic use. – Improved Null handling in kbmMWNullable and TkbmMWDateTime. – Improved Modified support in kbmMWNullable and TkbmMWDateTime. Will output to the default logger. – Fixed and improved TkbmMWCircularBuffer. methods to convert arguments and results. – Fixed A/V when attempting to use audit file. an incorrect duration value (instead of null) on invalid duration strings. – Fixed deactivating precise scheduled events. – Fixed events scheduled to start on day, month, week or year boundaries. – Fixed issues to initial delay in scheduled events. – Fixed parsing tags crossing line boundaries in XML parser. – Fixed various namespace issues in XML parser. – Fixed WIB compilation issue for XE. – Fixed TkbmMWStreamStore offset bug when writing first segment. – Fixed potential shutdown issue in Indy10 transports due to Indy10 bug. – Fixed kbmMWDependency non accumulating memory leaks. – Fixed NexusDB transport compilation. – Fixed Autoinc field detection in EDB (ElevateDB) adapter.